2018 has arrived with a roar as workplaces across Canada grapple with significant changes to the country’s workplace laws. Join us for a complimentary 1 hour webinar where we’ll highlight the changes you need to know about and identify the trends that we expect to impact your workplace in 2018. LSBC: This session will be registered for 1 hour of CPD credit with the Law Society of British Columbia. LSO: This program is eligible for up to 1 Substantive Hour with the Law Society of Ontario. Barreau du Québec: This program will allow participants to earn 1 CLE hour with the Barreau du Québec. 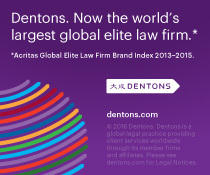 Please contact Carla Vasquez at carla.vasquez@dentons.com or +1 416 361 2377. Dentons Canada LLP is committed to accessibility for persons with disabilities. Please contact us at toronto.events@dentons.com in advance of the event if you have any particular accommodation requirements. We will work with you to make appropriate arrangements.